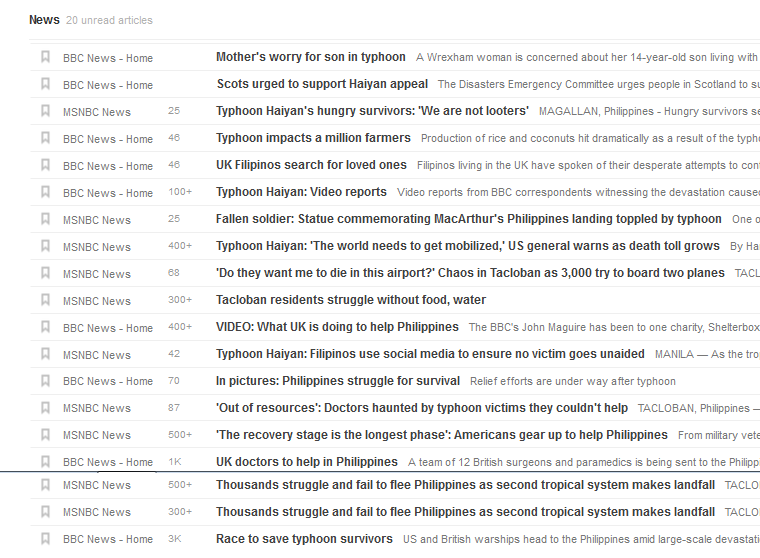 This morning I looked at my newsfeed and out of over 120 articles, 20 of them were about damage or relief or something about the typhoon that struck the Philippines. I’ve been thinking about my mom’s family who still live there. Because they’re my mom’s family, they’re also my family, even though I haven’t met very many of them. Aunts, uncles, cousins. I’ve been worrying the past few days if everyone is okay. The LDS Church issued a statement that all its missionaries serving in the Philippines are accounted for. Definitely good news. But I’ve been thinking more about the 10,000 or so who are missing or did not survive. This morning I called my mom and asked if she heard anything about her family. 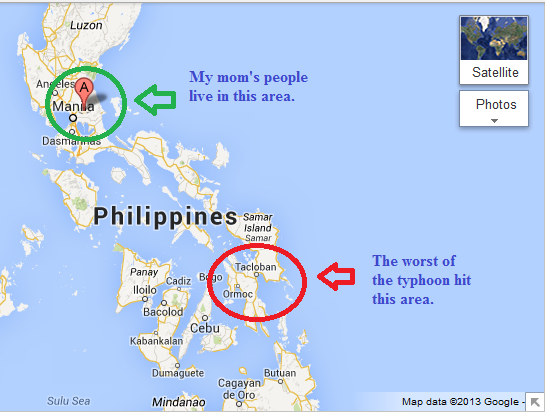 Mom lives in Florida, but she spoke with a cousin who keeps in touch more often with our relatives in the Philippines. Mom said that everyone is fine; they live in a more northwestern part and the typhoon did most of its damage in another part of the country. Mom said she’s sure her family got a lot of wind and rain, since the typhoon was as big as or bigger than the country itself, but she’s relieved that her family are safe. I’m relieved, too. One of the things I found encouraging about the headlines above is the clarion call to the world to get moving and help the Filipino citizens. Times like this remind us that we know how to reach out and be good people. These times motivate us to think about humanity and nudge our hearts to beat again, three times bigger. If I could fly over there and start separating debris and hugging people, I would. I’ll have to find another way. Find your favorite organization, and see what you can do to help. Am I ever going to catch up writing about vacation? Do you ever have the intention of writing deep, soul-searching rambles, letting your mind wander and return refreshed? Would you ever let your mind bend, commit a perambulatory dimension shift, jump up an energy level or two to uncharted parts of the brain? You would? Good for you. I’m just going to talk about the beach. 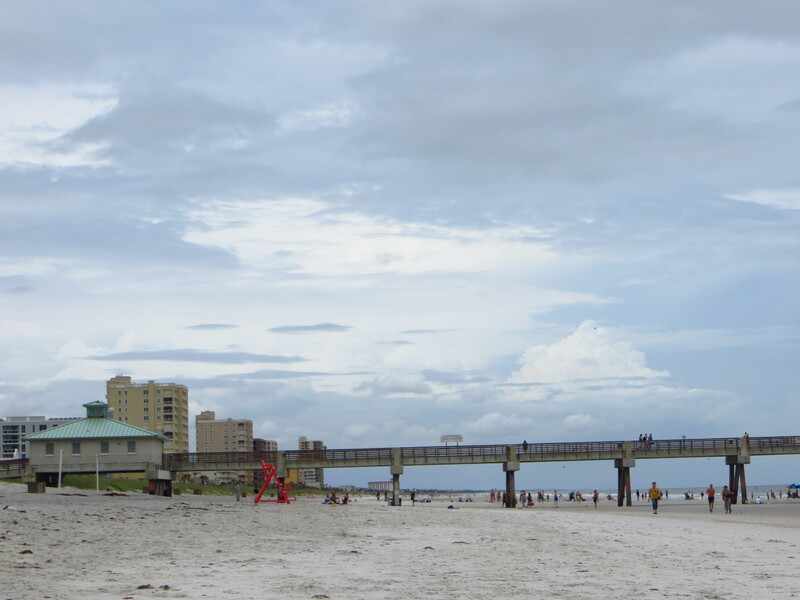 We decided to go back where it all began, at Jacksonville Beach, where Reilly proposed to me. When we got to the parking lot near the pier where we lost Jenny’s keys, it had started to rain. We waited for a little while then headed to a nearby gas station to get something to drink. When we returned to the parking lot, it was raining even harder. Because we are supreme nerds, both of us brought books to read and talk about. We cracked a window and read while it rained. About 45 minutes later, the rain stopped, and we carried our books, drinks, and towels and found a nice place on the sand. 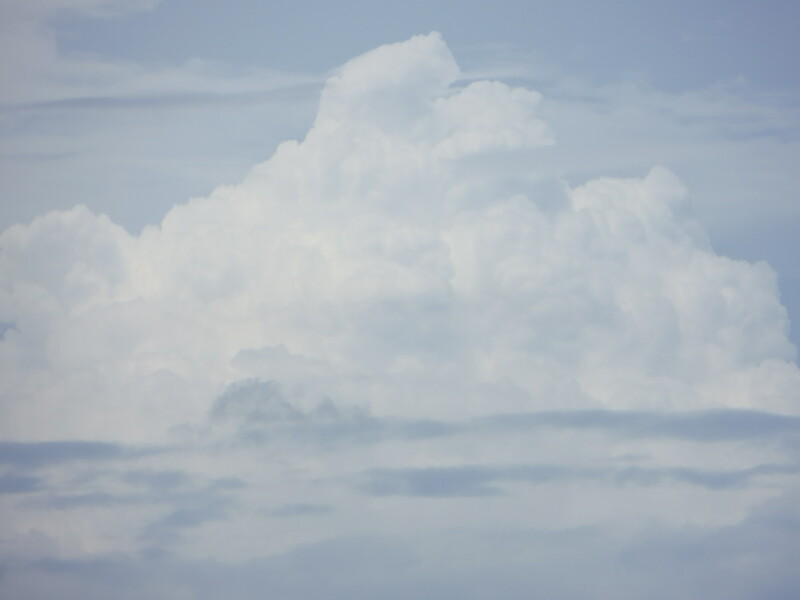 The sky was still overcast, so it wasn’t very hot. We only peed in the ocean because we’d been drinking those drinks from the gas station so we had to go, and the parking lot bathrooms were locked, and we thought it would be sort of fun to pee in the ocean. I mean, let’s be honest. 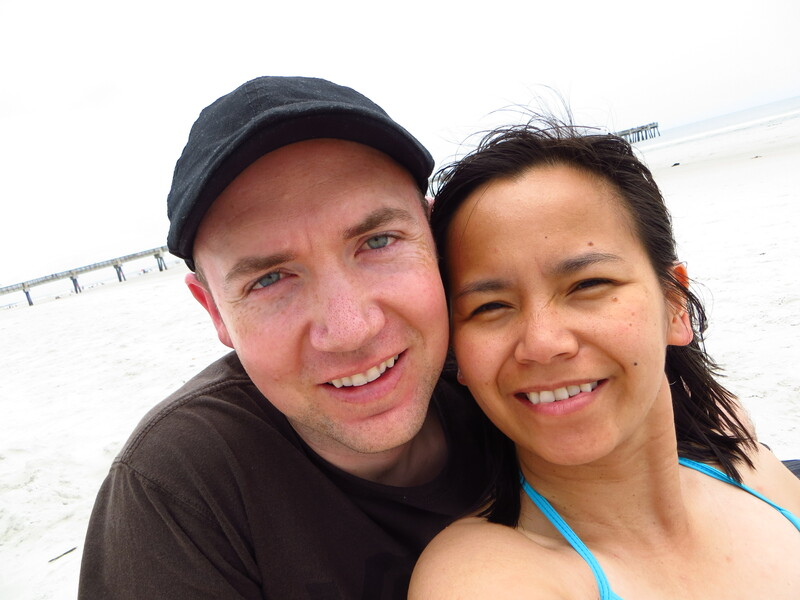 We walked casually enough to the water and allowed enough space between us so that we wouldn’t by grossed out by the each other’s warm current. We walked to where the water was about to our hips. We didn’t talk to each other for a few seconds, then I asked Reilly if he was done. Then we let the ocean gently roll in and rinse us. But here’s the thing: Do you know what acid rain is? So, because people pee in the ocean, and water from the ocean evaporates and forms clouds, and some of these clouds make rain, I wonder if we often think about how often we pee on ourselves. Despite this, I still and will always love the beach. 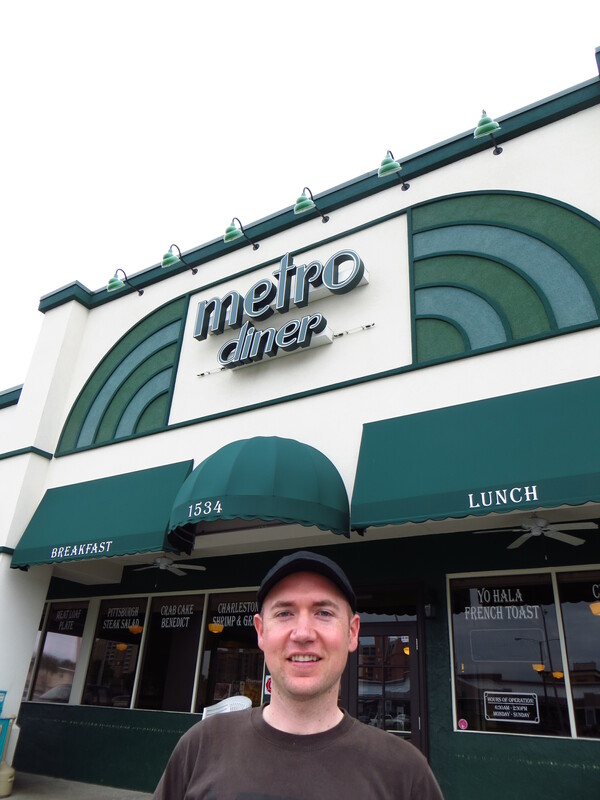 After a couple of hours it was lunchtime, and we decided to eat at the Metro Diner. It’s a small Jacksonville chain with some distinct charm. It’s just a few blocks from the beach. If it weren’t for my friend Jenny’s recommendation, we wouldn’t have thought to go there. Reilly had a Philly cheesesteak sandwich, and I had an enormous fish sandwich. The staff was really nice, and I took half my sandwich to go. It was a sunny December afternoon when we got engaged a year and a half ago. As is typical for Florida summer afternoons, it rained on our way back to my parents’ home. But not very much. And maybe we had driven far enough away from the ocean and the wind hadn’t blown the clouds to where the familiar smell in the rain wasn’t my own urine. Last month Reilly and I visited family and friends in Florida. Part of that trip included three days at Universal Studios in Orlando. Everyone who has visited Universal Studios since June 2010 has explored the Wizarding World of Harry Potter. If you’ve never been, it’s as amazing as everyone says it is. Even those who haven’t been enchanted by this ubiquitous enterprise will have a wonderful time at the park. The Hogwarts ride is inside a giant Hogwarts-looking castle. Portraits of various HP personalities adorn the heavy stone walls, and a lot of the people in the paintings move and talk to you, just like in the books/movies. Harry, Hermione, and Ron holograms come out to tell us what to expect during the ride. The effects impress, the ride thrills, and I talked to (at?) Harry during the whole ride experience. Both times. We also rode the Dragon Challenge roller coaster twice. Two dragons go out at the same time on different tracks, and they chase each other, twist around, and pass each other at high speeds. It’s one of my favorite rides. After our first time riding the Hogwarts ride, we decided to split a butterbeer. 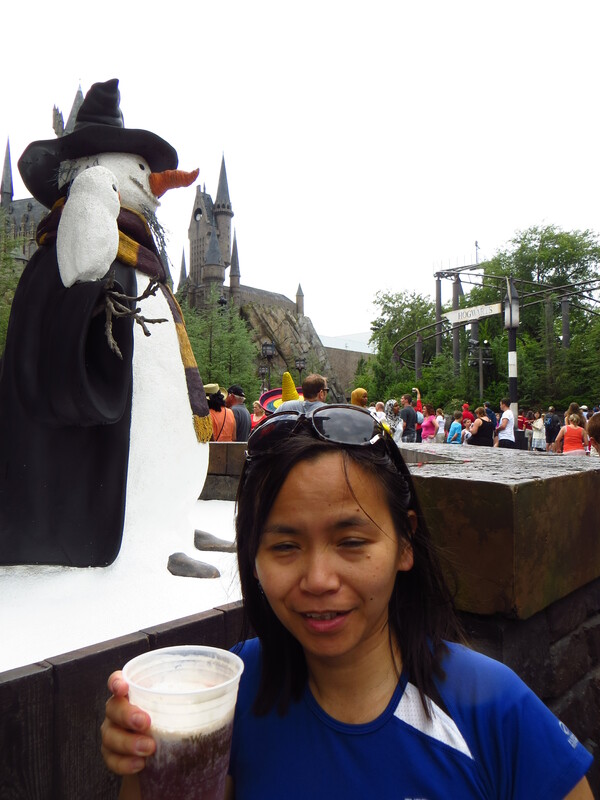 You can find butterbeer stands scattered throughout the town, and you can choose to drink it hot or cold in a throwaway plastic cup ($3.75) or a souvenir mug ($7.50-ish). I remember from the books how delicious butterbeer seemed. It sounded so creamy and sweet, and it was one of the most popular beverages the Hogwarts students drank whenever they visited London. I got the impression that because butter was so delicious, it was also very addicting, and kids would drink it until they nearly exploded. This was my impression. 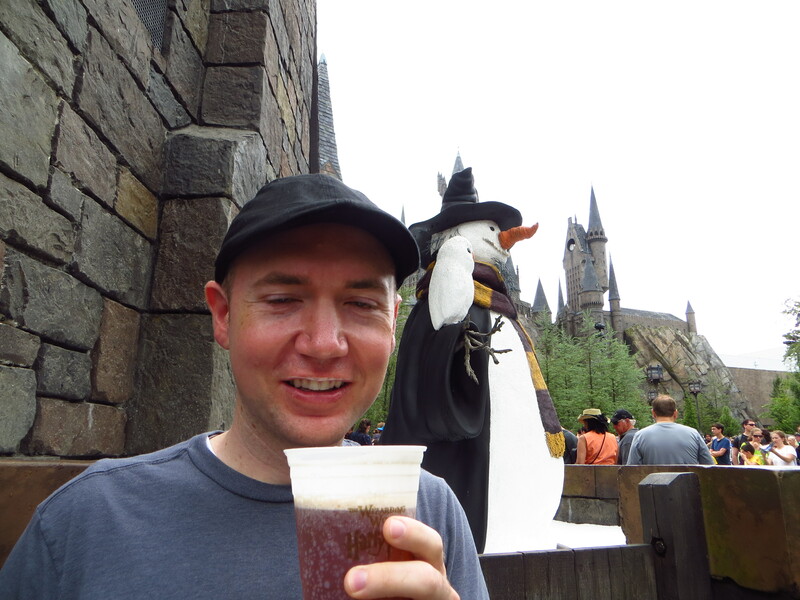 Butterbeer was magical because its bubbles tickled the taste buds, and the sugar went straight to the brain. Doesn’t it look like we were having a great time? Notice the level of the butterbeer in the cup, and you can figure out what lightweights we are. (Remember that we split that cup between us!) I mean, we did arrive at the park around 9:15 that morning, and we had been standing in line in ponchos so we wouldn’t get soaked from the rain for nearly an hour. So while I didn’t know we’d get sloshed at the time, I’m glad we treated ourselves so early in the morning. I just don’t know why it didn’t affect any of the kids around us that way. There’s a profound metaphor a-brewin’. While scrolling through my Facebook feed and ignoring the happy, oblivious posts of those who aren’t being affected by Sandy, I came across this photo. Click on it and say some prayers. Winds are howling, lights are flickering, transformers are exploding. Autobots wage their battle to destroy the evil forces of the Decepticons. There are reports of green electrical arcs in the sky, a scary form of the Aurora Borealis. I doubt New York has seen many hurricanes, and it probably hasn’t received the Noreasters that Boston has, but it seems that the Big Apple finally gets to enforce a lot of its emergency preparations. I know my friends are prepared. The island would seem different than a mainland hit, because it’s an island. Two and a half miles wide by 12-13 miles long. The tunnels and bridges are closed. Yet, no man is an island. But I also don’t want to downplay the rest of the Northeastern shore. They also have floods and fallen trees and power outages. Leaky ceilings and floating cars. My friends are prepared. I’ve seen their statuses of the provisions they’ve gathered. Lights, food, batteries, water, cheerful souls and prayerful hearts. When the winds stop whipping and the water subsides, they’ll use their optimism to clean up their towns and get back to their usual lives. Which happen to be extraordinary. Right now I imagine a former home of mine is receiving a lot of rain, lightning, and high winds. Many former homes have been part of those circumstances. I was born during a typhoon in the Philippines. This may be why I don’t really freak out during big rains. My birth versus the storm: I won, but I’ve also always made sure never to get too cocky. Don’t stand in an open field under lightning clouds. Don’t play in puddles and get ringworm. I lived in Guam. Seems if you live in the Pacific Ocean, you have to expect the whole range of tropical weather. Which would include earthquakes. And if volcanoes were nearby, those, too. I lived in Key West. Consistently warm weather often compelled my brother and me to stay inside with the air conditioning. But I played a lot outside, too. But I mostly blame Key West for making me break my brother’s arm. I lived in Jacksonville. Hurricanes mostly miss Jacksonville. 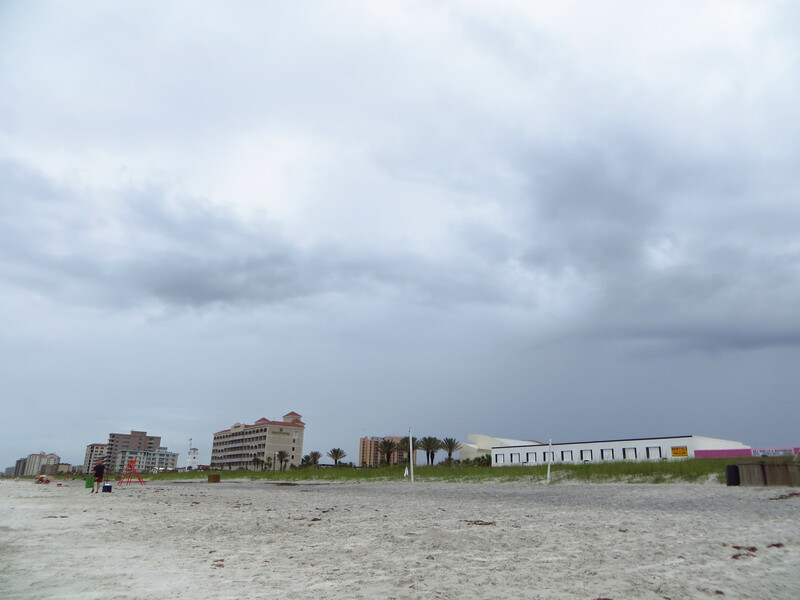 The city often catches the fringes of the swirlstorms, and it receives a lot of rain, but Jax has had its share of lucky breaks when hurricanes decide to turn northward toward the Carolinas. And that’s not so lucky for the Carolinas. I lived in New York City. That damn town greeted me with a blizzard, and it rained when I left it nearly 7 years later. That place brought out my allergies and gave me a true glimpse of depression. Rain, snow, strikes, sweltering and stifling heat. I miss that place. I live in Utah. The sun is out, I can see the mountains that still hang on to the turned leaves. I walked two blocks through wet and heavy snow the other day, and I felt nostalgic. Today, nary a trace of that white stuff. But the mountains cling to that, too. New York, I know you’re prepared. Candles, flashlights, water, food, batteries. Board games, radio. Dance parties. Storytime. Quality time. Run to the Hills. Or Washington Heights. I’ll be praying for you. This particular anniversary seems more significant because it happened on a Tuesday. September 11. Eleven years ago. All those elevens. All those ones. This poem happened the day after the 10th anniversary. The numbers switch around in that date and today’s date. Two lines are missing, or I’ve debated leaving two lines in, so I don’t think it’s a final draft. I can’t seem to find those lines right now. Or, there’s just no final draft at all. and starting over never crossed my mind. with motions that should be automatic. Even for Amy Adams and Glenn Close. OR Reilly’s birthday. But probably because it was a Sunday, and we had already ridden bikes down and up the Hudson River greenway and had lunch at Piper’s Kilt with my friend Adam. Which, Adam is close enough to Amy Adams, who is definitely a grand human talisman for good fortune. But at least we walked into the church after the bikeride, and we even had a good conversation with some friends in the foyer. The man I’ve known for four years now; his wife I met for the first time, which is different than the first time he met her, which was after he proposed to her. That’s a good story. Anyway, we should have known from the clouds it was going to rain. But it’s hard to know for sure what clouds mean anymore. I just knew the clouds kept our ride cool and shaded. No blinky brightness. Except that Reilly looks squinty in these pictures. Oh, well. I mean, the air was humid that evening, and we were standing in line, waiting for the doors to open so that we could take our seats. It was already sprinkling once we sat down. I put a plastic bag over my head, and Reilly had his hat on. We eavesdropped on chatter about the forecast guessing that the rain would end by 8:30, which would only have delayed the show 30 minutes. We could wait that long. Plus, the nice people sitting behind us held their golf umbrella over us. The stage lights shone on the set that looked like a giant tree house, but some of the set was on the ground and more spread out than Swiss Family Robinson, and still parts of it reached at least twenty feet into the air. The whole thing looked slippery. We talked about whether Amy Adams would risk slipping on an upper floor. We wondered about Glenn Close. We didn’t even know that she wasn’t really in the play, but her voice was featured as the Giant’s. The stage lights shone through sloppy-yet-sleeting drops of rain, which wasn’t letting up. Sort of, but not. One of the ushers who said the time was 8:15 also said he would have already “called it.” This same usher saw a camera flash go off near and he bounded up the stairs to the source of the crime and asked the camera’s owner to delete any pictures that were taken because no photography whatsoever is not allowed in Delacorte Theater so he’ll have to check the camera to make sure the pictures were deleted, thanks kindly. Ushers wore ponchos. Some spectators wore ponchos, but some held umbrellas. We still hoped for a Sunday miracle, in that we weren’t at all prepared for rain, but it seemed we weren’t getting anything even close. Not even Glenn. Finally at 8:30, they declared the show rained out. We walked westward in the 70s to Broadway and then south toward Columbus Circle. We thought about getting Reilly a McDonald’s ice cream cone or something similar for his birthday, but since Amy Adams the harbinger of good fortune did not appear, the McDonald’s ice cream machine was broken. Undeterred in our mission to find a dry place to have hot chocolate and some birthday dessert, we found a little cafe where we both had hot chocolate, I had a big chocolate chip cookie, and Reilly had a slice of of chocolate cake. At least it was a summer rain, and by the time we left the cute little dessert place, it was only sprinkling, which we were grateful for. Mostly dry, and high on chocolate onReilly’s birthday, we walked the rest of the way to Columbus Circle. We did get our tickets switched for Tuesday night, though. Which somehow meant clear skies and perfect weather. Even though the wolf/Cinderella’s prince is a total perv (as the original tale of Red Riding Hood suggests), Glenn Close meets her death as a vengeful giant and Amy Adams died leaving her baker husband alone, all the acting and singing was delightful, the props were clever and human, and that story actually sort of does end happily ever after.